Por eso, hemos pensado que hay otras personas que podrían explicarlo mejor que nosotros: nuestros clientes. El fabricante multinacional de sistemas de impresión Ricoh crea vínculos entre su planta de producción de cartuchos de tóner y rellenado en Reino Unido y una base de datos implementada en la planta con tecnología de control de Omron para poner en marcha un sistema de comunicación bidireccional real por primera vez. HNC's Rubber Roll Grinders and Groovers featuring Omron Technology. https://www.hnc.ltd.uk Introducing HNC's range of advanced Rubber Roll Grinders and Groovers. This range of innovative machines are used to precision grind the profiles of Rubber or Polyurethane rolls. The software built into HNC's range of Advanced Automatic Roll Grinders and Groovers greatly reduces the need for highly skilled operators. With a minimum of knowledge you can successfully profile rubber or polyurethane rollers up to 600 mm in diameter & many metres in length. The machine's software has both imperial (inch) & metric capability, and can be switched between sixteen different languages at the touch of a button. Each machine is fully automatic and comes complete with a fully enclosed interlocked guarding system and complete dust extraction tube ready to connect to a dust extractor. A Joint video production between Omron and Halifax Numerical Controls Ltd detailing the use of the NJ PLC on the RG300 Rubber roll grinder. 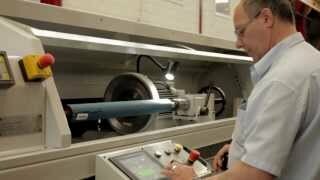 The video highlights the use of the NJ controller on the RG300 rubber roll grinding machine.